her sale, Zurich, 13-16 October 1948 (to Szümowski). Tor Engeström, and thence by descent to the present owner. A modello for the painting of Abraham serving the Angels, dated 1624, acquired in 1947 by the French State and now in the Musée Crozatier du Puy-en-Velay, France, Paris, Grand Palais, Seicento, exhib. cat., 1988, no. 156. According to Bartolozzi, the artist's biographer, Vignali painted the picture for the famous mathematician Galileo, who was himself a talented draughstman. 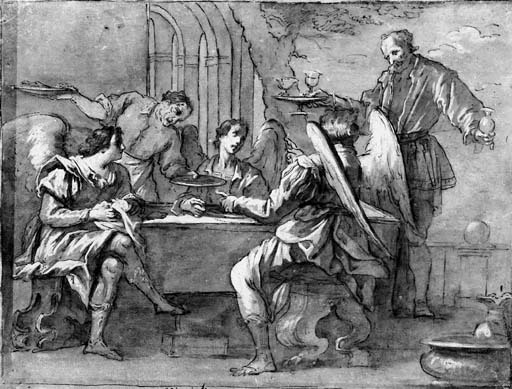 Vignali's taste for strong contrasts between light and shadow is particularly well expressed in his compositional drawings such as the present one and others in the Uffizi and in the British Museum, C. Thiem, Florentiner Zeichner des Frühbarock, Munich, 1977, nos. 146 and 148-50. An oil sketch for the whole composition was sold in Milan, Finarte, 11 April 1964.